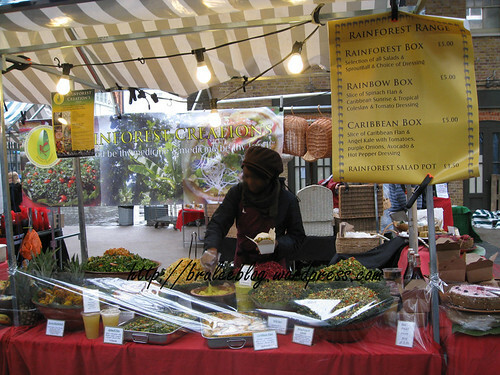 Rainforest Creations is a stall found on certain days at Old Spitalfields Market, as well as at stalls in the Chelsea, Hammersmith and Alexandra Palace markets. They also recently opened permanent spot in North Kensington. 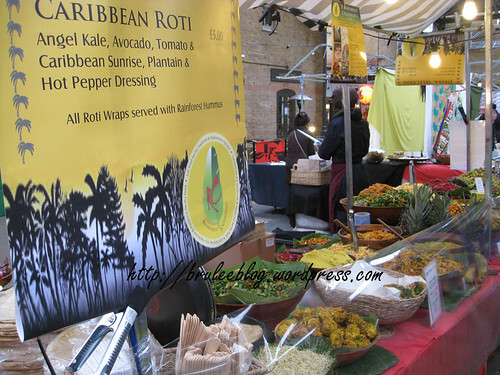 They specialize in organic, raw, vegetarian (and I think vegan) food, with Caribbean flavours. 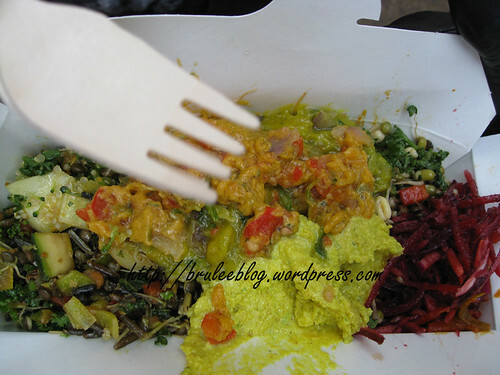 I ordered a £5 Rainbow Box, which was stuffed with a selction of Tropical Coleslaw, Caribbean Sunrise, Red Quinoa, Wild Rice, Mung beans and Lentils, Chickpeas, Angel Kale and Avocado salads, as well as sprouted hummus, an Akashe Ball (kind of like a falafel), and dressing. Everything was placed in a take out box, and served with a little wooden fork. It was a little hard to pick out the flavours of all the individual salads as they were all in close quarters, but everything tasted fresh and crisp, with some salads having a mild curry flavour and some salads having some satisfying crunch. The box was quite large too, and could easily feed two people (or one very hungry person). This is the kind of meal that you’d love to have on a hot day. I loved that it was good value, as well as being healthy and tasty. Great concept for an eatery. You find the coolest places! That looks yummy! We’re going to have to try that next time we’re in London.